An original anime production by prolific writer Jun Maeda is premiering first and exclusively on Animax – Asia’s first 24-hour Japanese anime channel. Renowned Japanese visual studio Key has come together with Progressive Animation (P.A.) Works for Charlotte, which will air on the same day as its Japan telecast on Animax Asia, in July. Boasting local subtitles including English, Bahasa Indonesia, Mandarin and Thai, the anime was written by Key’s co-founder Jun Maeda, who is also contributing to the musical score. The anime will also feature character designs by fellow Key colleague Na-Ge. The two had worked with the same producers on popular 2010 anime Angel Beats! and together, the dream team promises to conjure up the same magic in Charlotte. Charlotte, rumoured to have been based on Maeda’s own early life, is set in an alternate world where a few children come into unusual superpowers upon puberty. One of the colouful characters is Jōjirō Takajyō, who can move so fast he appears to be teleporting. There’s also student singer Yusa Nishimori, who can communicate with the dead. The children are enrolled into Houshinomi Academy, which has its own student council for guiding those who encounter problems with their newfound abilities. The protagonist? Yū Otosaka, an ill-mannered first-year transfer who uses his ability to possess another person’s body for five seconds in order to cheat in his exams. When Yū meets school council president Nao Tomori, the fate of these extraordinary children begins to unravel. Will the youthful duo be strong enough to fight their destiny? 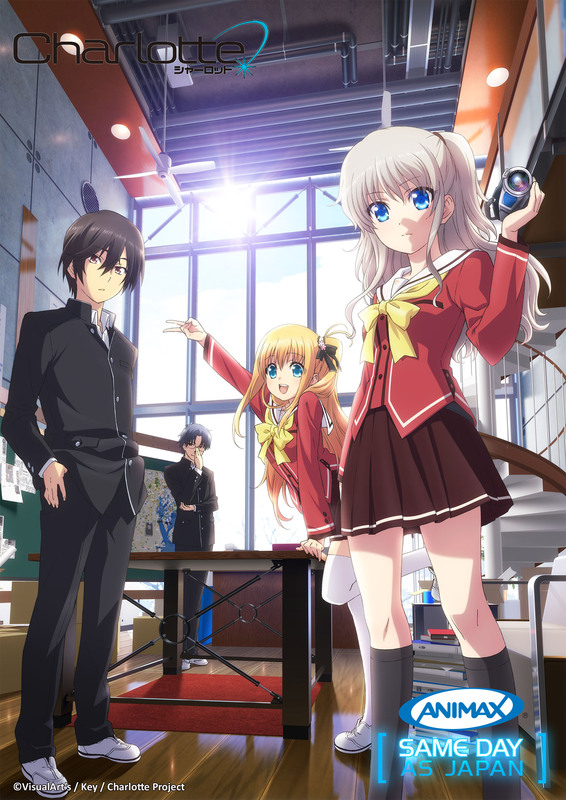 Charlotte premieres on 4 July 2015, airing every Saturday night at 12.30am with an encore the next day at 8pm, first and exclusively on Animax Asia.